Glad it's the weekend too and looking for some rest! This salsa looks like a great way to rest and enjoy. 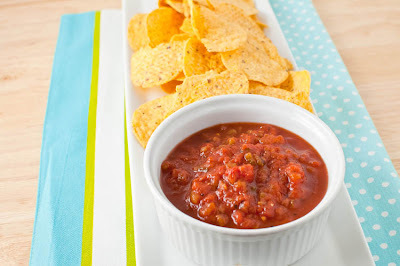 I LOVE salsa- this looks perfect! I love a good salsa! Yours sounds delicious and full of flavor! 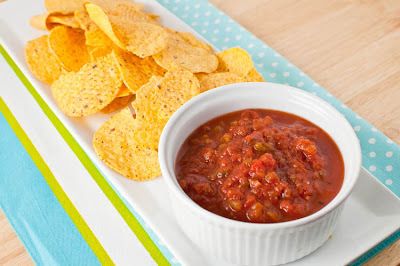 Your delicious looking salsa gave me a bad case of the munchies! Searching my pantry for salsa ingredients... Have a great relaxing weekend, Peggy! I'm always in the mood for salsa! Perfect thing to have on hand for the weekend and instant snacking! Hi! peggy, Lovely platter sounds very fabulous.......It has spring written all over it. Nicely done! I bookmarked this recipe. I just planted my tomatoes for my summer garden. This recipe would be great with fresh tomatoes. Go salsa! This looks great. It will be perfect for memorial weekend! That photo makes me want to grab some chips and start dipping at my monitor! Beautiful job!! There is something about fresh salsa that just makes it taste so much better than out of a jar! Looks delicious! I adore salsa! Love your fuss free recipe. I've never made my own salsa, I always buy ready made ones. I am surprised that the recipe sounds pretty easy, I didn't expect this, thanks for sharing :)! I just made a green salsa the other day; it's going to go great with the crock-pot carnitas I'm going to make ;-) I've never made salsa with canned tomatoes so I'm happy to find a recipe like yours to make it with! It's easy and delicious, whee! Great-looking salsa! I will be interested to hear how your tortillas turn out, I've never tried my hand at making my own. Homemade salsa is SOOOOO much better and jarred. Great recipe! Ohhh homemade salsa! I love it. I need to try this recipe next time I make mexican dish!